fototazo: The Image: Kevin Thrasher, "North Adams, MA"
The Image: Kevin Thrasher, "North Adams, MA"
When I saw snow on the hillside that had not yet melted in the morning sunlight, I knew there was probably something interesting there. Looking down from that hill, across the road and onto the people's homes, I imagined someone being raised in that town, living their life in one of those houses and then being laid to rest near their home. For me, it illustrates a life cycle. At the time I was making photographs in graveyards. I was trying to come up with some great truths about life and death. In the end, this is the only good photo I made in a graveyard. 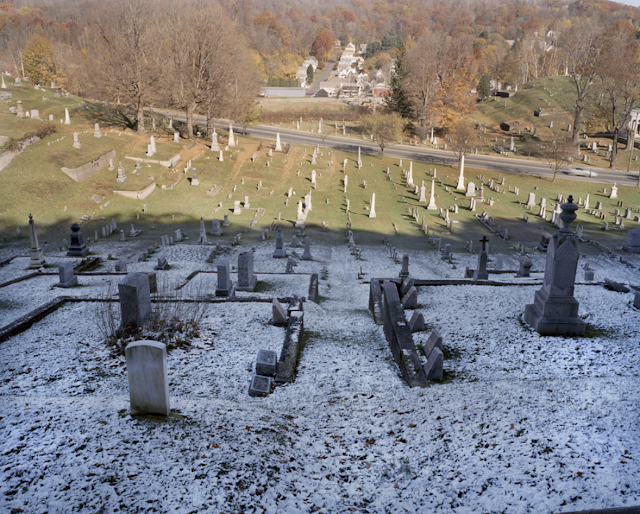 Walker Evans made a wonderful photograph in a graveyard, I know his photograph was in my head when I made my photograph.